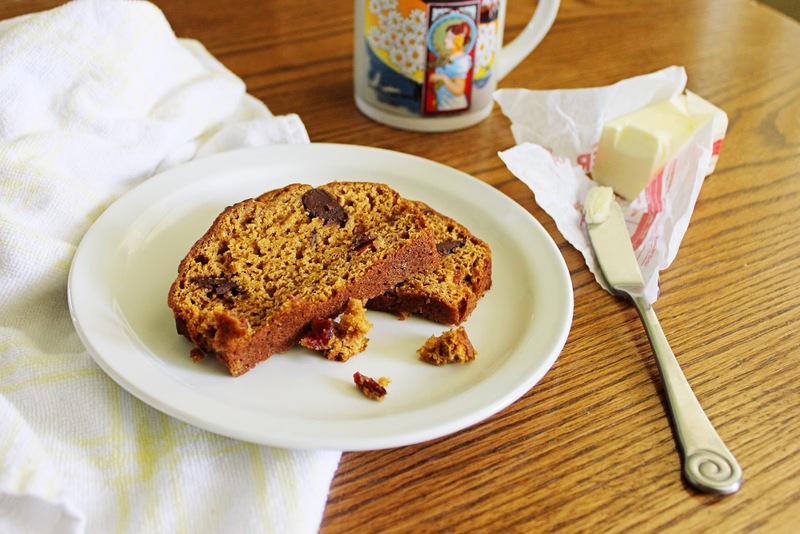 Start your day with a slice of this delicious sweet pumpkin bread studded with chocolate and cranberries. The other day at the grocery store I spotted a bag of candy corn and just had to have it. Lately I have been kind of craving fall, the weather, the colors, the smells and of course the food! I also brought home a can of pumpkin that day and tucked it away in the pantry. Well if you stop by here often then you already know I am obsessed with bread, especially breakfast breads. I wanted to try something I new, there I said it… I had NEVER baked with pumpkin before. I don’t like pumpkin pie, but I know pumpkin is super nutritious, so I pumpkin bread it was. I scanned a few cookbooks and did a web search, what I decided on was kind of a combination of a few recipes. With a wish of luck and a lot of ingredients, I am pleased to admit the result is quite tasty; a fragrant, sweet breakfast bread worthy of your attention. I highly recommend giving pumpkin a try if you haven’t before. I think you’ll enjoy this delicious, sweet pumpkin bread studded with chocolate and cranberries, happy baking! Preheat your oven to 350º and prepare a large loaf pan with baking spray. In a large bowl combine the pumpkin, egg, applesauce, water, brown sugar and honey. In a separate bowl whisk together the flours, baking powder, baking soda, salt, cinnamon, cloves and ginger. Add the dry ingredients into the wet and stir until combined, fold in the chocolate and cranberries. Spread the batter into the loaf pan and bake for 45-50 minutes. Cool in the pan 10 minutes, remove to wire rack and cool completely. This is a sweet pumpkin bread and it looks great! It really is delicious, I’ve actually made 2 batches of it now, I can’t stop eating it! Yum!!! I’ve never had pumpkin bread before but it sure looks yummy! I love the healthy ingredients in this recipe – honey, whole wheat flour. Thanks for sharing.